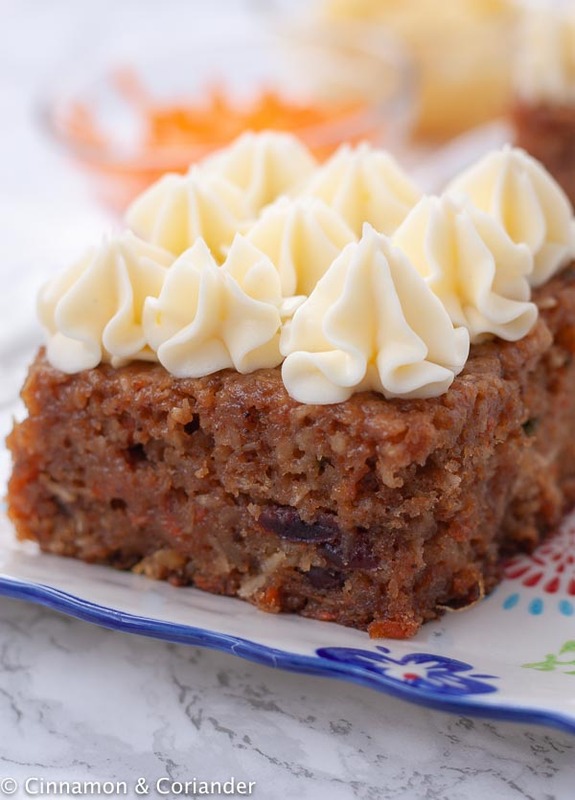 This award-winning Carrot Cake recipe features crushed pineapples, coconut, raisins and a smooth & tangy cream cheese frosting – an easy Easter dessert that is simple to throw together and feeds a large crowd. This Award-Finning Carrot Cake recipe will transform your Easter Brunch into a Hip-Hop-Happenin’ Bunny patch. I love the Easter holidays for many reasons, but really, I just want to go completely overboard with carrot cake. 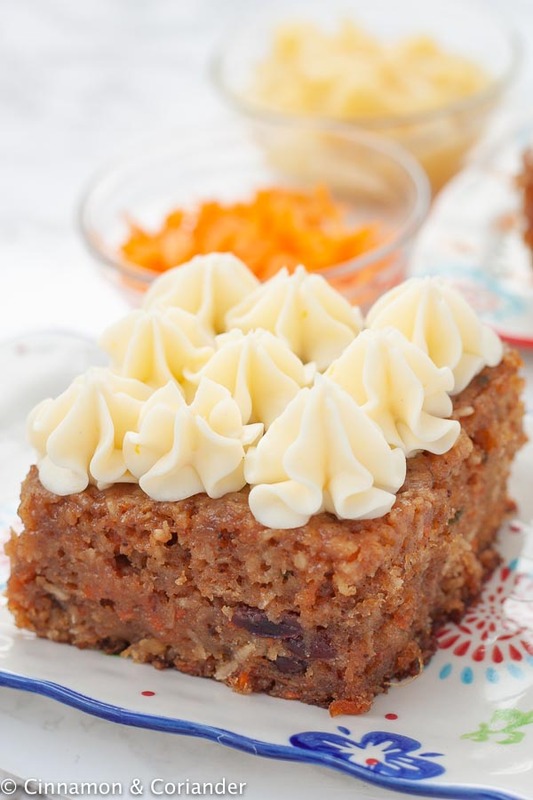 This carrot cake recipe is one you will want to print out and pin to your fridge. In fact, it will ruin all other carrot cakes forever. Don’t say I didn’t warn you. 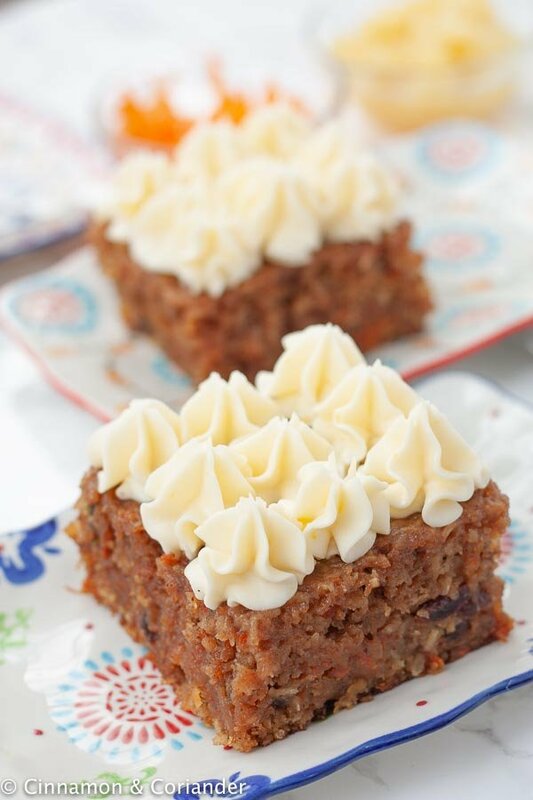 I first made this easy carrot sheet cake for a fancy Easter Brunch event along with a bunch of elaborate jar desserts, truffles, bite-sized cheesecakes, cupcakes etc. Guess what was gone first? 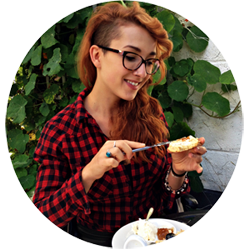 YES, this carrot cake! Apparently, people fought over it and declared it the best carrot cake ever! The carrot cake recipe makes a 9×13 sheet cake making this the perfect easy dessert for a big crowd! This carrot cake does not skimp on anything! It comes with all the favorite add-ins – grated carrots, pineapple, shredded coconut, and raisins. The cake is extra moist thanks to a caramel drizzle which is poured on top of the freshly baked carrot cake. What I love about this carrot cake recipe is that it has the perfect ratio of cream cheese frosting to cake! This Carrot Sheet Cake is so incredibly moist and bursting with flavor. Along with pineapple, carrots, raisins, and coconut, I added lots of cinnamon and a little nutmeg and cloves to the carrot cake batter. The secret to this award-winning carrot cake recipe? What takes this easy carrot sheet cake to the next level of moistness is the homemade buttermilk caramel fudge drizzle we pour on top of the warm sheet cake. Now, the longer you allow for the carrot cake to soak up all the delicious caramel, the better! I usually make the sheet cake at least one day ahead of time, drizzle, wrap the pan in cling film and let the carrot cake just soak up all that glorious caramel. Since it’s made in a large deep sheet pan this cake easily feeds 15 – 20 people. You want to cut it into smallish pieces because this cake is seriously rich! It’s the perfect decadent homemade dessert for Easter or any occasion that you need a simple yet amazing cake for. And no, we sometimes just don’t have the time to make a layer cake, right? You can dress the carrot cake up a bit more by piping the cream cheese frosting onto the cake with a piping bag. Some marzipan carrots or chopped pistachios would be a good idea. Or you can just leave things simple and sweet. Enjoy! After grating the carrots, I put them on 3 layers of kitchen paper towels and give them a good squeeze to prevent the carrot cake batter from getting too moist. Drink the juice, it’s good for you. The carrot cake tastes best if it has at least 6 hours time to rest so that the cake can absorb the caramel drizzle completely. Make it one day ahead of time and the flavor and texture will be outstanding. Make sure you soak your raisins and don’t throw out that soaking liquid. I use rum but you can do Cointreau – or orange juice. You butter and cream cheese should be at room temperature to get the perfect white and fluffy frosting. What is the best way to store this carrot cake? I store the carrot cake at room temperature if I plan on eating it on the same day. If you want to store it in the fridge, that’s fine but make sure to put it into a cake tin or a sealable big Tupperware. You can also freeze individual slices of cake and let them thaw on the kitchen counter overnight. You can make this carrot sheet cake a bit healthier by replacing half of the white flour with whole wheat. Use any chopped nut you want in the cake batter. I used walnuts but pecans and pistachios would be awesome as well. If you’re not big on raisins, add some soaked cranberries or chopped candied ginger. For more recipe inspiration for Easter, check out my German Egg Liqueur, this Lemon Poppy Seed Cheesecake und these Raspberry Muffins. For vegan Easter recipes, make sure to check out my Vegan Easter Brunch Recipe Round-up. 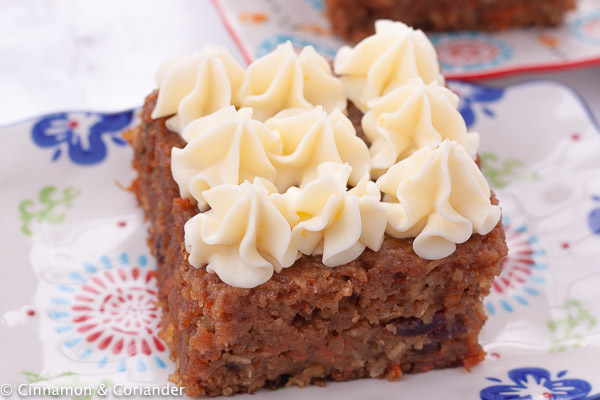 ★ Did you make and love this easy homemade carrot cake recipe? Give it your review below! And make sure to share your creations by tagging me on Instagram! 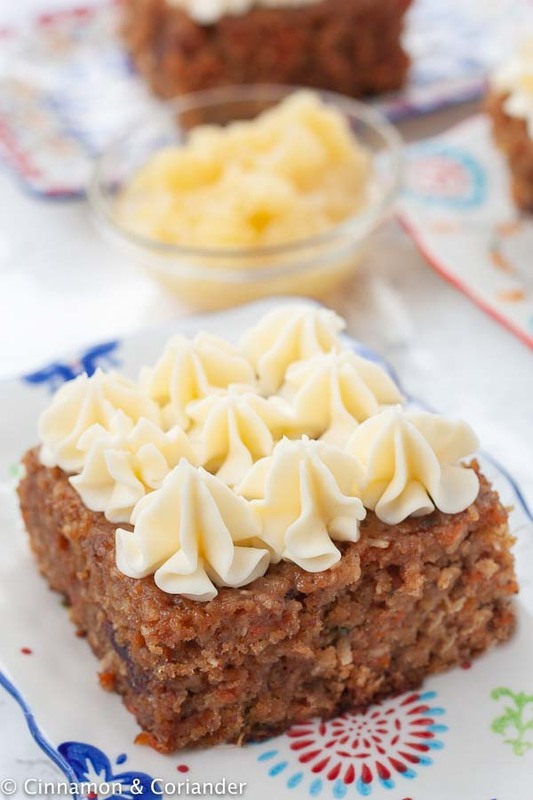 This award-winning Carrot Cake recipe features a smooth tangy cream cheese frosting - this easy Easter dessert is super simple to throw together and feeds a large crowd. Preheat the oven to 180 C or 375 F. Line a big deep square baking pan (30 x 23 cm / 9x13 inch) with parchment paper or some cooking spray. 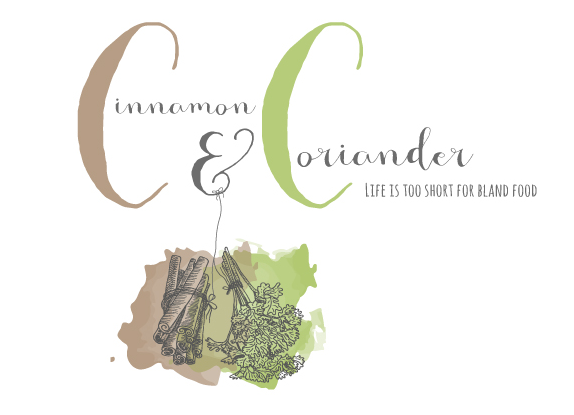 Mix flour, baking soda, spices and salt in a bowl. In a separate bowl, mix sugar, eggs buttermilk, oil and vanilla until smooth. Stir dry mix into the wet mix until you have a smooth batter. If there are still some streaks of flour, thats no problem. Add crushed pineapple, grated carrots (see notes), coconut and nuts. Also, stir in the raisins making sure to reserve the liquid. Spread the batter into the lines mold and bake for 30 minutes, then cover with foil and bake for 10 to 15 minutes more until a skewer inserted into the middle of the cake comes out clean with just some moist crumbs. Begin cooking the caramel drizzle during the last minutes of baking. Add all ingredients for the drizzle apart from vanilla to a saucepan and bring to a boil, reduce heat and let simmer for 5 to 7 minutes until nice and brown. Remove from heat, add vanilla and 3 tbsp of the soaking rum from the raisins and a pinch or salt. Stir. When the cake is done, remove cake from oven, take a wooden skewer and prick the cake all over. Drizzle with caramel sauce and let the cake cool down completely. For the frosting cream cream cheese and butter together for about 3 minutes, until white and fluffy. Slowly add the powdered sugar until you have a smooth frosting. Add lemon juice and vanilla and taste. Add more to your liking. Frost the cooled cake with the cream cheese frosting and serve. After grating the carrots, I put them on 3 layers of kitchen paper towels and give them a good squeeze to prevent the carrot cake batter from getting too moist. Drink the juice, it's good for you. Make sure you soak your raisins and don't throw out that soaking liquid. I use rum but you can do Cointreau - or orange juice.